This was my first and last Co2 laser project. It’s also the laser I formed my original website logo from. These pages are the modern re-incarnation of my old laser projects web page Jon’s Homebuilt Lasers, still available from the links to the side of this page. I’ve tried to document each image, or set of images below and to explain the laser equipment, setup and functioning to the best of my abilities. The intention is not to directly teach you how a laser works, but to show you some of the things I did to get a laser online and operational. If you would like to learn in detail about how lasers work, you can check the CORD LEOT pages. They are older materials, but still very relevant. I received this particular Co2 laser head from the same person I purchased the 65 Watt Merrimack Co2 laser head from. Because it had been damaged in shipping, they were kind enough to send me this laser as a replacement. It is an older and more bulky design I believe, but it worked quite well for a ‘used’ laser and it was a lot of fun and quite exciting the first time it came to life. 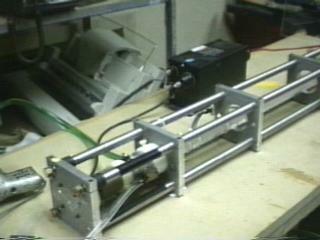 This is not a home built laser head, however the support systems are home-brewed. The gas supply system, water cooling system, etc were pieced together from equipment I had available. This laser uses water cooled electrodes, which means the water actually has to flow through two electrodes with the high voltage source running through them. Several times the laser failed to fire because I did not allow the water to circulate through the de-ionizing filter long enough, and the water was conducting the voltage. 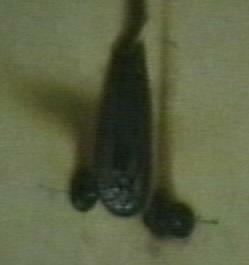 The tube would flicker and shudder, but would not ignite properly. De-ionizing / deionising water removes mineral ions from the water which makes it a conductive substance. If you’re shopping for de-ionizing filters, there are several different grades of de-ionizing filters, so it’s best to reference the link above and decide which grade you need. Consider the resistivity, distance to the closest ground or opposite terminal, etc. I do not remember the details of where I sourced the deionising (DI) filter, but I bought it online. I bought the filter housing from a local Sears hardware store and copied the dimensions off a filter box, then went and did some online shopping. I do remember that the DI filter was not dirt cheap, but it wasn’t an expensive item either. To move the DI water I originally used a $5 drill attached pump on a drill with a locking handle. This wasn’t a great idea and I moved to an electrically isolated submersible pump to prevent any high voltage from back feeding into the buildings wiring. The electrical system was, at first, one Neon Sign Transformer, 15kVAC at 30ma controlled with a large over-sized motor-driven variac I had from another project. At later points I used an additional NST to provide a total of 60ma at 15kVAC into the laser but never got to building the large diode chains needed to rectify the current into DC. For all intents and purposes this ran as a pulsed laser never reaching it’s peak output due to the AC source. The gas system consisted of an ‘Edwards Speedivac 2’ which I bought on eBay which was connected to an inline fine-adjustment needle valve. From there the vacuum line connected to one end of the laser head. On the other end of the laser I had a gas tank from the local industrial gas supplier, which was filled with ‘laser mix’. It was connected to the primary tank regulator, and then through another needle valve. From there a pressure/vacuum guage was connected on a T and the line fed into the laser. By adjusting the fine adjustment needle valves on the vacuum and gas side I was able to achieve a pressure and gas flow which lased and kept the laser fairly cool on performing ok. The ‘laser mix’ I got from the gas company was one of several generic mixtures they offered for Co2 laser. Not having any specs on this laser I decided to go for the middle of a road mix based on what they offered, and what I had read on several laser resources online. If you’re looking for the proper gas mix for your Co2 laser project you should do a little research and see what is common for the type of laser you are building, slow flow or fast flow. 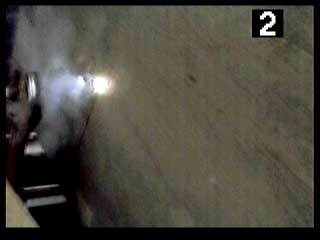 In the following photo you can see the Co2 laser running on air at low pressure. It was an experiment to test the electrical and vacuum system, and the color of the glow looked nice for the photo. In the photo below you can see the laser running on the make shift but sturdy test bench and pointed at a 1×6 piece of wood. 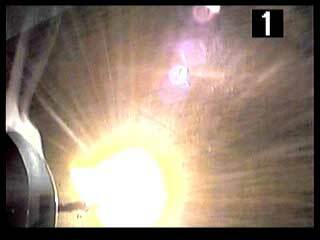 In this photo the laser is running unfocused and thus it tends to generate more of a ‘hot spot’ rather than a shower of sparks and smoke like it would if it were focused and run with an assist gas. Without the lens, it’s kind of like a ‘hot spot’ generator! If you look closely at the photo you can see that in front of the burning plank is an acrylic / Plexiglas shield which is the full width of the table and about 2 feet high. It is there to limit the possibility of back-scattered or refracted laser output making it beyond that point. Since this Co2 laser runs in the far-infrared range, at 10,600nm wavelength, it will be blocked by acrylic where a visible or near-infrared laser would pass right through it. 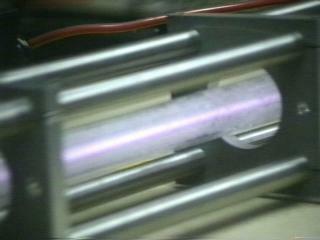 Although the plasma in the bore looks more blue or purple colored, it’s actually a very soothing salmon pink glow. 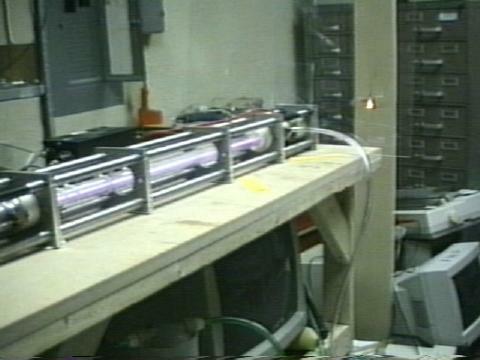 In these photo’s the laser was powered at 15,000 volts AC at 30ma from a Neon Sign Transformer (NST). This tube was capable of handling twice this amount of power, which is why I had a second transformer on hand for future experiments. This area was exposed to the laser output for 30-45 seconds. The next photo is of the Output Coupler (OC) end of the Co2 Laser. You should be able to make out the clear gas inlet line going into the side of the machined mechanical coupler. The red lead is one of the high voltage leads, and the coolant (de-ionized water) feeds in from the opposite side. The OC is mounted on the metal plate at the end of the assembly, and isolated from the electrode/gas/water inlet with some form of flexible brown rubber tube. The black tape on the Invar steel rod was to limit some problems I was experiencing with arc-over when pressure in the laser bore was too high, and the current sought an easier path. 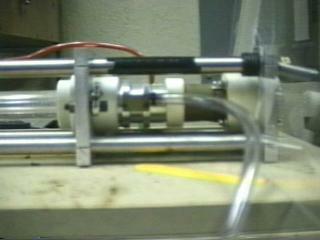 The following photo is of a shot of the bore, water jacket, and support structure of the laser. The bore of the laser is made from borosilicate glass, also known as Pyrex. The water jacket is Pyrex as well and it’s inside diameter is approximately twice the outside diameter of the bore. Borosilicate is capable of withstanding high temperatures and is very strong, properties which make it great for this purpose. The metal plates are from machined aluminum and clamped onto possibly Invar nickle/steel bars. Invar has a very low coefficient of thermal expansion which makes it perfect for keeping optics closely aligned. If you look closely at pictures of this laser, you will see that only the ends of the bore, water jacket and optics are supported with this assembly. Otherwise the bore and water jacket pass cleanly through the middle without touching anything. The red line in the back is one of the high voltage leads. The foggy appearance of the bore/water jacket in this shot is caused by thousands of tiny bubbles inside of the water jacket. They did vanish over time resulting in a crystal clear view of the plasma in the bore, very cool to see. Next, below, a few more details of this setup are revealed. 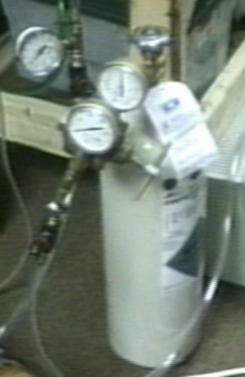 Again you can see the electrical tape wrapped around the Invar bar to limit arc-over when the tube is at high pressure. 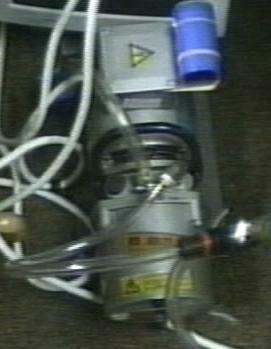 The clear tube leading in on the right is a gas/vacuum line, and the green tube is where the de-ionized water coolant was pumped from the laser and into the tank. For this particular setup I drew water through the laser with the pump, rather than forcing it into the laser, to reduce the chance of a blockage causing the water jacket to pressurize and rupture a seal. The large bronze bolts on the end-face of the laser head are used to adjust the alignment of the optics. They have a very fine thread, and the plate is backed by very strong spiral springs between the plate and the Invar rods. In the background is the black 15kV/30ma Neon Sign Transformer I was using for my initial tests. Although I did run this laser with the second NST phase-matched to the first with great results, I did not get pictures of that. At the time I was doing this project, several many years ago, I was just excited to be able to get any pictures to put up on the old website. The next two photos show the vacuum and gas delivery system as described at the beginning of this article. This is a relatively small vacuum pump and weighs around 25 pounds if I had to guess. I bought it used and had to flush it with new oil, run it for several hours, then repeat the process. It was certainly up to performing the task required of it in running this laser. The Co2 laser mix was bought from a large industrial gas company with a local shop. I bought the tank which added to my costs original costs a bit, but it takes the whole issue of ‘tank rental and return’ out of the process. The alternate option is to buy 3 tanks, 1 each of Co2, Nitrogen and Helium and using a mixing manifold to adjust your own gas mixture. This can get very expensive very fast. 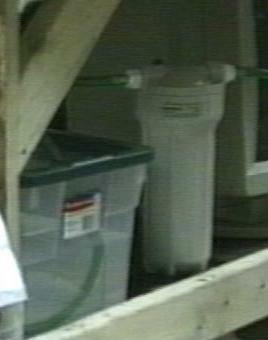 The next picture is just a shot which shows the water reservoir and the filter canister for the DI filter underneath the desk. This is a non-complex setup, though if you do this type of setup you’ll need to get the proper NPT to hose-barb adapters for the filter housing. If you made it to the bottom of this page, here are a couple more photos for you. They are of the Co2 laser running with a focusing optic onto a piece of thin plywood, with no assist gas. In commercial laser cutting systems an assist gas is sometimes blown in past the objects and into the cutting line. This keeps the optics clear of debris, blows cutting debris out of the path of the laser beam, and depending on the gas, can actually accelerate the cutting process. Do you still have the structure of this laser? How long was the discharge and optical path lengths. Do you know the bore diameter, flow rate, etc.? I’m building a folded optical resonator, with an Invar superstructure, but I’d like to get an idea of how “beastly” this particular laser was? It looks pretty over-engineered on the structure side. Hi Scott, I don’t have this laser any longer, I sold it many years ago. I believe this laser was quite stable as far as the structure is concerned. Most of it was built to support and stabilize the optics. If I recall correctly, and these are just estimates, the bore itself would have been about 3/4″ ID and the water jacket was about 1.5″-2″ Outside diameter. Overall length of the structure was about 6 feet and the optics were mounted in the front and back plates which were about 1/2 to 3/4″ thick material. There used to be some good co2 laser optics calculation pages which took into consideration minimum bore diameter for a particular length to eliminate vignetting and also calculate the Output Coupler reflectivity, High Reflector radius of curvature, etc. but I haven’t seen them in a while, they may be out there in some form or another. please give me one co2 laser gas mixtures of long life ratio. Hi I don’t have any information on gas mixes for sealed type Co2 lasers. Commercial producers of sealed Co2 lasers use a catalyst inside the laser tube along with proprietary gas mixes to ensure long lived tubes. Without the catalyst the life span of a tube will be much shorter. You may find some additional information in ‘Sam’s Laser FAQ’ in the section under Co2 lasers. Best of luck. please tell me percents gases for a 40w sealed co2 laser tube. 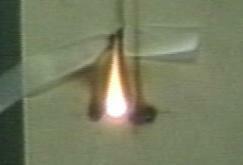 I mixed gases into a sealed co2 laser,but when I start HV 10.5kv i didnt see never laser.